The history of Hummel park is fairly basic im afraid. I always like to include a bit of history on the locations for this site but what can i say here, its a park. It stands on 202 acres of land donated in 1930 to the city of Omaha. 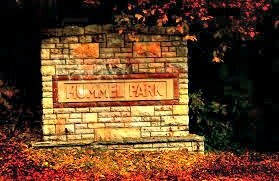 It was named after a long serving superintendent of Omaha's Parks and Recreation Department, his name was J.B. Hummel. This park has a very disturbing past. By far the most horrifying things to happen on these grounds was the hanging and mutilation of African-Americans during the early 1900's when lynch mobs would form. It is not known exactly how many people were murdered on the park, but there is one tree in particular that they liked to use. So much so that the tree started to lean in the direction of of the branch that was always used on it. This has set a rather disturbing trend in the park for all the other plant life there as the other trees and plants seem to bend in the same direction as the hanging branch with no reasonable explanation. It is not surprising that apparitions often form in haunted areas, and here is no exception. Various forms have been seen here, from the people who were hung on the trees to the other ghostly characters. One of these characters is thought to be that of a German immigrant called Jacob Clatanoff who settled in the area before it was known as Hummel with his wife. The story goes that she murdered him and buried his body in the area now known as Hummel park. After the murder she disappeared from the area without a trace, and its believed she fled with another man. Whether they plotted together will never be known, and his body has never been found. But his apparition still lingers in the park, seen as a gentleman dressed in the standard casual early 1900's attire. The next story is the most questionable and also the most disturbing. 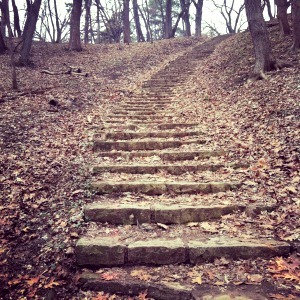 There are a set of steps in the park which number around 200, i say around because the story about these stairs is that they change the amount of steps in them on different occasions that you climb them. Now i know how this sounds and im also very skeptical about this one. There are a number of stories as to why these stairs may be haunted, and these include from animal sacrifice to cult practices. This sounds like common campfire stories but the odd thing about this is the number of different people who have said the same thing. If you are ever in the area i suggest you try it, as you never know, you may find something you wont expect.